If it's remote heli hiking trips you're searching for, consider my story. One of the best outdoor adventures of my life was to a little known but spectacular corner of the world: South Nahanni in the Northwest Territories, Canada. I stumbled across Solitude Excursions in a magazine ad, on my way to another heli-hiking adventure near Revelstoke, B.C. I remember talking with my husband about the remoteness and opportunities for exploration - and then we put away the magazine and went on with life. Months later, one rainy winter night in Seattle as we were making our annual "wish list" of hiking adventures for the coming year, we pulled out the ad and looked over it again. Here was a brand new, remote corner of the Earth to explore. Could we make this work in our schedules and budget? The short answer: yes, we definitely made it work into our plans, and I have never been a happier hiker than in the Nahanni in the summer of 2009. Why was this trip so fantastic? Because it allowed me to feel like a bona fide adventurer, after being cooped up in "civilization" for most of my life! Let's get started on a realistic note. Because of its remote northern location, a trip into the Mackenzie Mountains will take a considerable amount of advance planning. But let me assure you: Sunny Petersen will work with you step by step to answer your questions and iron out all of the travel details. My advice: take her advice on which flights to book, accommodations on the way to and from their base camp, and all the other little details of travel arrangements. To begin your remote helihiking trip, book a commercial flight to Fort Simpson, Northwest Territories. From there, a bush plane will deliver you to base camp on a pristine river truly in the middle of wilderness. That's where the helicopter is parked, ready to whisk you in any direction! It goes without saying that you shouldn't be nervous to get into a small plane or a helicopter. That's how you get to the good stuff! The possibilities are mind blowing. Fascinated by fossils? Fossil Canyon is a great day trip from base camp. Interested in photographing mountain goats, sheep, or caribou? Kraft Mountain, coming up! Sunny and her husband Werner Aschbacher know this land intimately, offering plenty of suggestions for exploration. And if you'd like to soak in hot springs, or have a quiet rest day in camp, that can be built into your itinerary, too. Guided multi-day excursions away from base camp are designed around your personal interests. We were flown by helicopter into the Ragged Range, camping in high, isolated mountain lake basins and meadows. Geology, photography, and wildlife were tops on our list, and we weren't disappointed. And what a privilege, to wander and explore unspoiled areas, with no chance of encountering another human. As you would expect, it's strictly tents and dehydrated food on a remote helihiking trip. But guess what? After long days of hiking (endless hours of daylight that far north), your sleeping bag feels like a king sized bed in a four star hotel! This caliber of hiking is far beyond marked trails or mapped routes. The Nahanni is a place where you can truly wander, being in charge of your own safety and destination. You can put your boots on game trails traversing steep slopes. You can circumnavigate deep mountain lakes ringed with craggy peaks. You can wander along streams, going as far as you'd like and then turning around to enjoy the endless vistas, patches of wildflowers, a wildlife spotting, and the tug of a breeze on your hair. I'm trying to paint a picture of an unspoiled, yet accessible, remoteness. 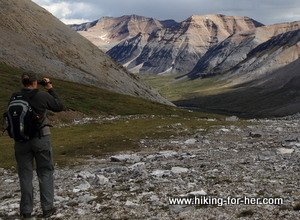 That's why I've set up a photo gallery of some classic South Nahanni terrain. After looking at these photos, I'm sure you would agree that this type of remote helihiking trip isn't for every hiker. But maybe it's just what you're looking for. Contact me with your questions, I love talking about remote helihiking trips into the Nahanni! Just use the handy CONTACT link at the top left of this page. For more types of hiking that might appeal to you, go here.